When the weather turns cold and I am craving comfort foods, I love this Cheesy Breakfast Hash Brown Casserole to kick-start my days. It is warm and filling and perfect for those days when you have guests staying over. Everyone loves waking up to a house filled with delicious smells and being served a beautiful breakfast! 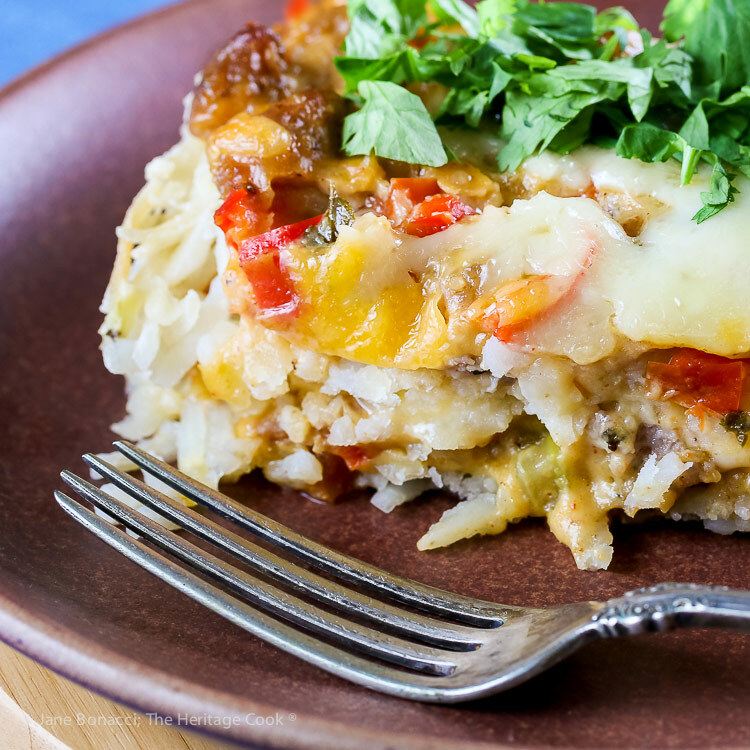 Cook up some sausage (be sure it is gluten-free) and add sautéed vegetables and a creamy sauce, then layer it over frozen hash browns and top with cheese – bake and enjoy! It doesn’t get much easier than this. While this is traditionally served for breakfast, it also can be served any time of the day. I love breakfast for dinner and this makes a perfect main course. It tastes rich and indulgent and is made with thickened evaporated milk. I love that it is made primarily with pantry and freezer ingredients. The next time the handmade bulk pork sausage made by your butcher goes on sale, buy extra and freeze it in individual packages. Then you can make this anytime quickly. The original recipe came from Bon Appetit and I have modified it to reduce some calories while maintaining the creamy texture. I boosted the vegetables and seasonings to turn it into a Mexican flavored meal. You can adjust the seasonings to customize it for your family’s preferences. I also simplified the steps to make it easier to put together. Be sure to use a very large skillet to make the sausage mixture. I love my 12-inch Anolon stir-fry pan. It has very high sides that helps when I am making large batches of foods or when I want to contain the popping of oil if I am sautéing vegetables. The next time you are hosting guests or having brunch with your friends, I hope you make this Cheesy Breakfast Hash Brown Casserole as part of your menu. It is a crowd pleaser! Always be sure that no fillers have been added to the ground sausage. If you want to be sure it is safe, buy plain ground pork and add your own seasonings. Homemade sausage is delicious and so easy to make. Use my recipe or make up your own. Once you see how simple it is, you may never buy prepared sausage again! Preheat the oven to 350°F. Butter a 9x13x2-inch baking dish. Set aside. Prepare the Components: Cook the sausage in a very large skillet (preferably with high sides) over medium-high heat until brown, breaking the clumps into small pieces, about 5 minutes. Add the vegetables and cook, stirring occasionally, until slightly softened, about 4 minutes. Stir in oregano, cumin, and chili powder. Taste and add salt and pepper as needed. Stir the evaporated milk into the sausage mixture. Stir in the cornstarch mixture. Cook over medium heat, stirring regularly to avoid lumps, until the mixture comes to a boil and thickens, about 5 minutes. Remove from the heat. Mix the cheeses together in a bowl and set aside. Bake the casserole uncovered until the potatoes are tender and the layers are hot all the way through, about 45 to 60 minutes. Sprinkle with parsley and serve.